Playing works by Scarlatti, Aguado, Barrios and more. Tickets : $20, $15 conc. St James Church, 173 King St, Sydney. Danzons, Mambos, Choros, Cha Cha and Habaneras. Music includes Renaissance Lute Dances and works by Carulli, Guiliani, Vivaldi & de Falla. St Luke's Church. Lord St, Roseville. Music by JS Bach- Violin Sonata #1 in g minor (transcribed Moran), Renaissance lute dances by John Dowland, Tarrega, Carolan Irish harp music, Moran Hasta Manana & Memories of Spain, Lauro: Venezualan Waltzes & Barrios: La Catedral, Choro de Suadade & La Ultima Cancion. This is Phil's only Sydney recital this year! 2.30 pm Hornsby Uniting Church. 24 William St, Hornsby. Tickets at the door. $15 adults, $10 Children/Concession. Music by Byrd, Bach, Vivaldi, Giuliani, Carulli & de Falla. Sunday 5th June 2.30 pm. Peninsula Music Club. Loquat Valley School Hall, 1977 Pittwater Rd, Bayview. Music for Guitar Trio (with Alan Plummer & Phillip Bolliger) and flute (Jocelyn Fazzone). Music by Bach, Albeniz, Mozart, Scott Joplin, Piazzolla & more. Morning concert at Linfield Uniting Church Solo guitar. Music from Spain & Latin America-Tarrega, Barrios, Morel and others. Wednesday 24th February at 2pm. Robertson Village Music Society. Flute & Guitar Recital with Jocelyn Edey-Fazzonne. Music by Bach, Mozart, Piazzolla, Villa-Lobos etc. Sunday 13th & 20th June. 4) F. Schubert: Sonata in A minor, D. 821 "Arpeggione"
Mozart, Villa-Lobos, Ibert, Mouquet & Piazzolla. By invitation, contact Phil for details. With Jocelyn Edey-Fazzone (Flute) Music by Villa-Lobos, Bach, Mozart, Mouquet & Piazzolla. Solo recital first half Trio with flute & cello 2nd half. Parkes Little Theatre cnr Bogan/Dalton St, Parkes. 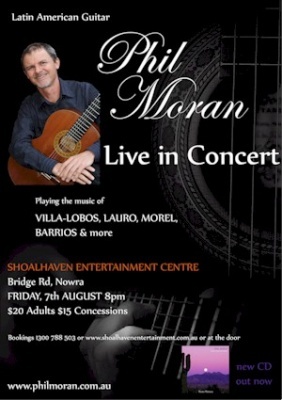 (Concierto de Aranjuez) with the Eastern Sydney Chamber Orchestra.